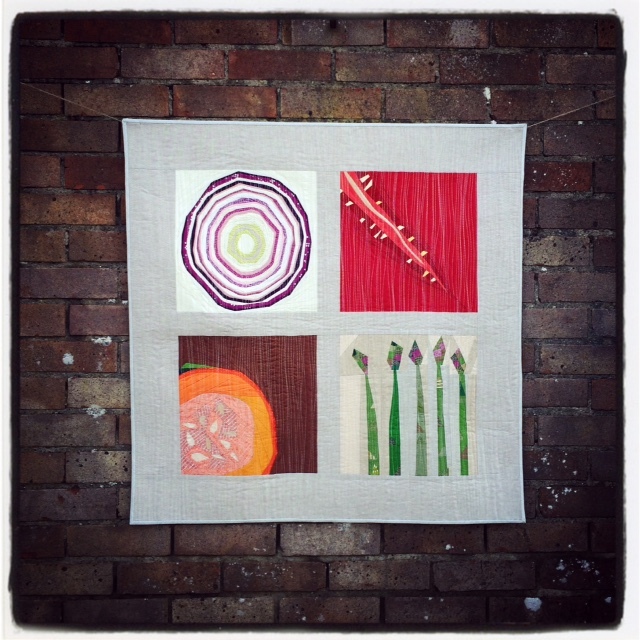 I knew I would end up making a second Vegetable patch quilt. Even when I was elbow deep in purple strips, fashioning the red cabbage from the first quilt, I couldn’t help but let my mind drift to other vegetables and how they might be constructed. Like the first, this second version was completed some time ago, and since it’s not really the weather for allotments yet, I took advantage of a weathered wall and the smallest segment of sunshine to snap some photographs whilst away for the school half term a few weeks ago. I’m not ashamed to say that I am in love! As pleased as I am with the finished product, once again it was the process of its construction that really got me going. The first thing I did was to think about vegetables, perhaps more than any sane person really should, in a creative way. I was drawn to both their outward appearance as well as the patterns and textures that can be found beneath the peel and skin. I wanted the blocks to work in harmony with the first, and was looking for vegetables with similar colours and tones. The first block to be completed was the red onion, which, up until recently, was my most liked media on Instagram (thank you beloved followers). I saw this block as the younger brother of the leek block from the first version and had two things I wanted to achieve with it. Firstly, to increase the curves and have the rings be more rounded. Secondly, I wanted the colours of a red onion to be really obvious. I wanted people to know what it was as soon as they looked at it. Fabric section for this block was key. 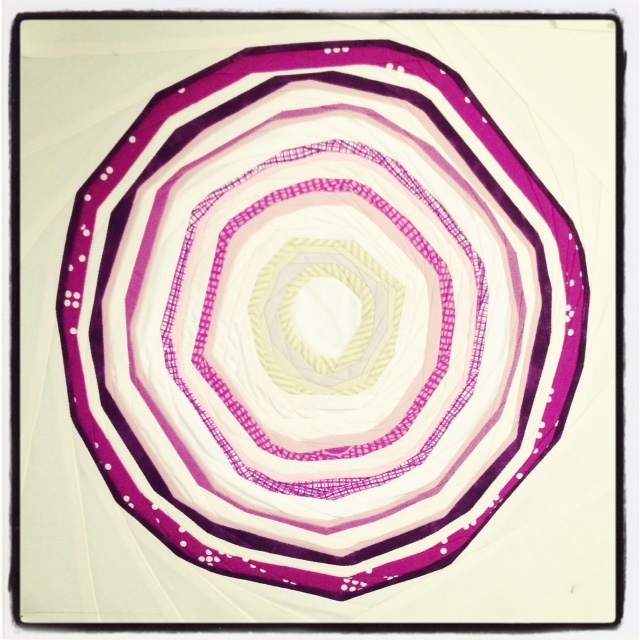 I mixed Kona solids with small-scale prints by Denyse Schmidt and Violet Craft amongst others. Purple is a colour I’m lacking in my stash so I was pleased to find pieces that I could use amongst my numerous scraps. I can’t lie and say I wasn’t worried when I was making this block. 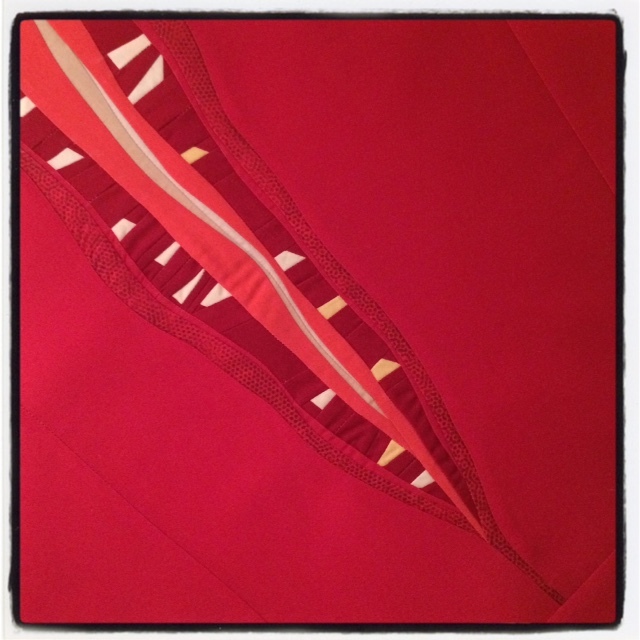 Yes, my idea was working and the fabrics looked great together, but to make those curves you must have a lot of seams. I mean, a lot! Luckily, once it was pressed and starched and stretched…oh my…it lied pretty flat, and what didn’t was quickly sorted out by the quilting. Next came the green element. I chose asparagus for its outside detail and the range of colours it comes in. Like the carrot block from the first version, I wanted this block to showcase the thin, long nature of the vegetable. 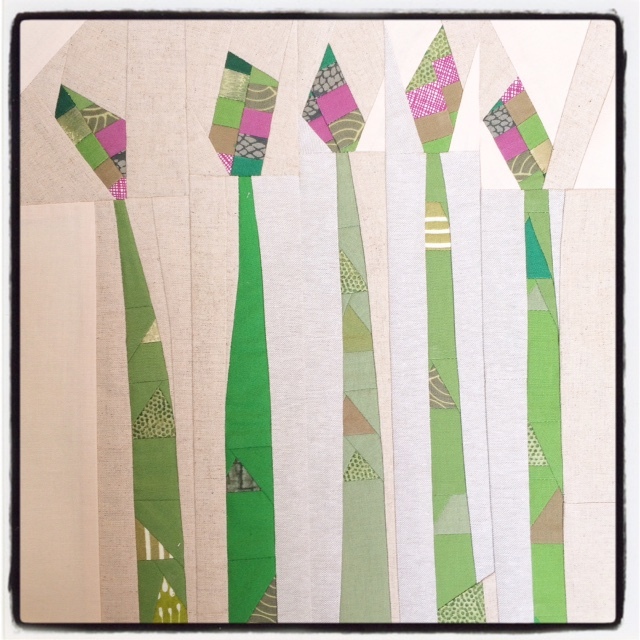 After scribbling down my process on paper, I made a test block, the first time I’d done so for these quilts, and realised that some changes would have to be made to better convey the asparagus. I made my initial strips wider and re-worked the tips. Again, fabric selection was important, and thank God for crosshatch by Carolyn Friedlander. It’s so textured and perfect for these kind of blocks. I was a little worried that the neutral background would be lost when I came to sash the blocks, but the mix of linens and solids really makes the asparagus spears stand out. For the red element I choose a chili and like the tomato block, it has a lot going on inside! I created the seeds first, then cut free hand curves, another first on this project, to create the iconic shape of the chili. The background was a kona solid in a since-forgotten shade of red that really make the block stand out and gives it some “fire”. The last block was pumpkin. I probably struggled with this once the most. I knew I wanted an orange element to complete the quilt top, but was stumped for a long while before settling on the seasonal squash. I was probably influenced by the recent Halloween celebrations and the fact that I was snacking on a lot of spiced pumpkin seeds. Go figure! Again, like the chili pepper, I constructed the seeds first, then used a similar technique to the red onion to create the shape of the pumpkin. I debated whether or not to add some green before settling on a small section. In hindsight I think it’s a tad too vibrant, but think it still works by creating a little contrast. So, I now had the four blocks and was very pleased with them. The rest was easier! I knew I wanted the layout to be the same as the previous version. That meant sashing the four blocks with Essex yarn dyed linen in flax from Robert Kaufman before adding a wider border in the same fabric. The backing was the same as before, a seeded, off-white cotton, and the quilting was also the same, although this time it was done on my new machine with a wider throat! 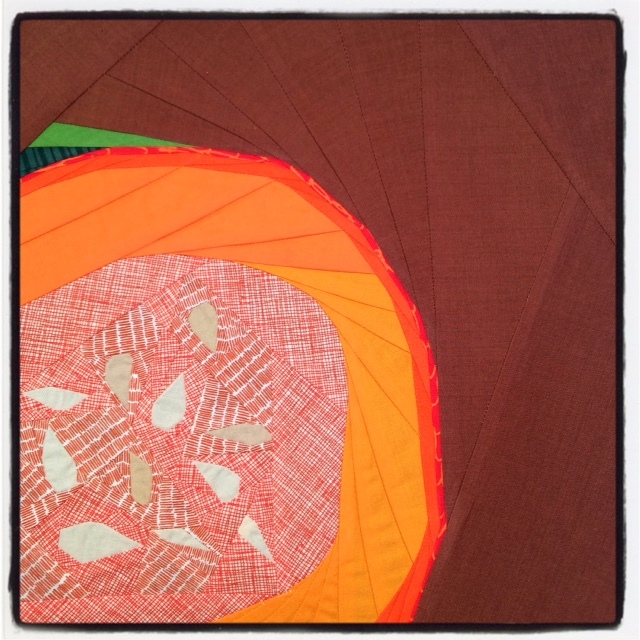 Lots of organic, dense quilting that suits the subject matter perfectly. Binding…you guessed it, the same! My long-hoarded crosshatch from Carolyn Friedlander. I love these quilts and they are my most favourite things I’ve ever made. They look really good together and seeing them like this makes all the trail, error and mishaps worth it. Remember, I have no pattern for these blocks. No templates or measurements to cut. It’s all in my head, and even then I only have a vague idea about where I’m going with it. But that’s part of the fun, exploring my creativity, and it’s something I would encourage you all to do. You might be surprised where the journey takes you. For me, it was to the bottom of the allotment! Thanks for visiting! Oh wait, I need your help! I really want to build my stash of basics, fabrics that are perfect for these types of blocks. I have a lot of solids, but I’m looking for suggestions for small-scale prints in greens, reds, oranges, purples and browns. I have some ideas, like Crosshatch, Sketch, Pearl Bracelets and Squared Elements, but do you know of any more? Leave your suggestions in the comments and there might by a prize at the end of it for one of you! I really love your vegetable quilts, the new one is fantastic. For basics, I have found for me that it works better to just buy individual small scale prints as I see ones I like in a colour I like. I find that I don’t want to use 6 different colours of the same blender print in a piece when it comes time to use them, that instead I like to find a bunch of blenders, or tone on tone prints from different lines to put together. But for lines, there are also the cotton and steel basics and a number of new art gallery blenders, both of which are really lovely. So much thought went into these. Wow! I love your asparagus and the little pieces triangles on the stalks! So, so creative. I am a Pearl Bracelets fangirl but might I also suggest the Prisma Elements by Art Gallery? You really are becoming a genius at this improv stuff. I enjoy how you can use the improv process to create artwork that is still recognizable to the masses and not just a bunch of beautiful shapes. (Which would also be okay!) Honestly, I think you need to make one more, and have a triptych series. Garlic? Avocado? Artichoke? Potatoes? Ears of corn! As for fabrics, also look for Living Elements, Oval Elements, Studio Stash, maybe some oakshots, batiks, V&Co various ranges (ombré! ), and/or Comma. These quilts are just spectacular! The detail & the design, just everything is perfect. I’m not surprised that these are your favourites, they really are amazing. The fabrics that you mentioned would be my suggestions but other than that the a Confetti Dots line would be a a good one as well. Brilliant work & well done, can’t wait to see the next in the series! I love this quilt just as much as the first one in the series! I’m looking forward to what vegetables will be in the next one! You know I love these quilts! As for additional fabrics: how about some hand dyes? 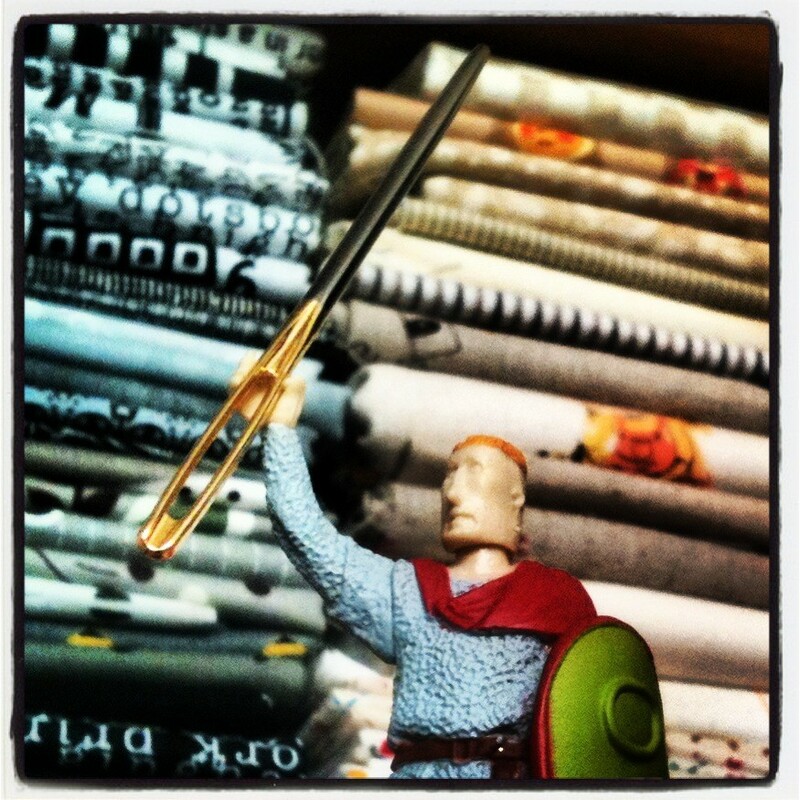 Short cottons are fantastic, too. (Ohh! I just bought some lovely yellows, would make for terrific lemons, or corn!) 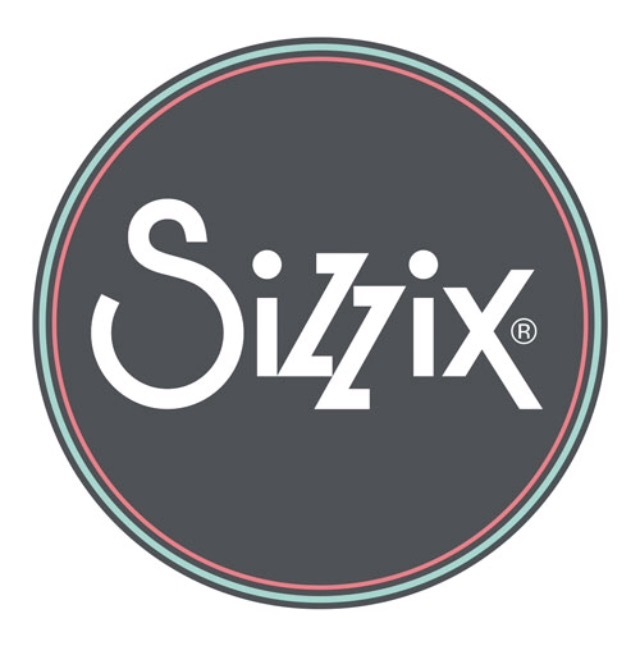 Essex linen, and/or yarn dyed linen… Honestly, hand dying PFD fabric, or overdyeing commercial prints, may be the “easiest” way to get what you want. Hey, using vegetables to dye would be very meta!! Fusions Meadow and Spot On – both by Robert Kaufman are 2 of my suggestions. 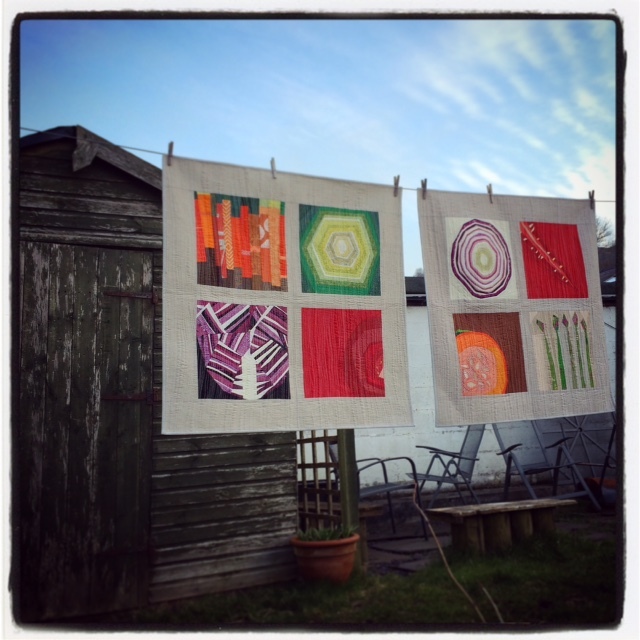 I am really inspired by your two quilts – amazing use of fabric! 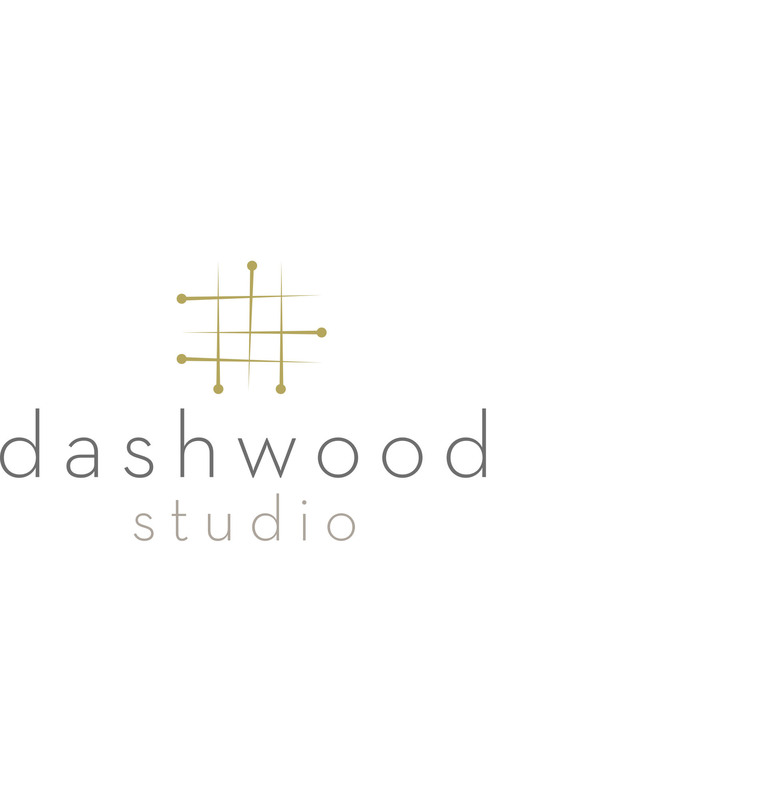 Thank you for sharing your process! The onion loves the onion.